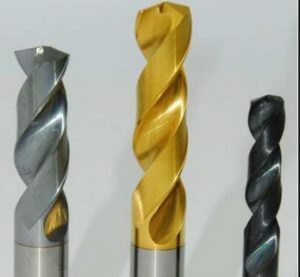 Three tips to make your drill bits last longer. 1. Choose the right bit. A black oxide-coated bit helps reduce friction and increase chip flow, but shouldn’t be used on nonferrous materials. TiN is a titanium nitride with a gold color that can run faster than uncoated bits and increase tool life. TiCN is a titanium carbonitride material that has a blue-gray color and is great for stainless, cast iron and aluminum. TiALN is titanium aluminum nitride that has a violet color and is used in high-alloy carbon steels, nickel-based materials and titanium; not for aluminum. 2. Drill at slow speed. A small twist bit, less than 3/16˝, can drill through most metals at 3,000 rpm. 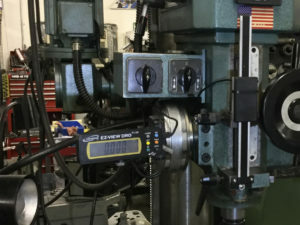 However, larger twist bits, 11/16˝ to 1˝, should be used at a much slower rate: 350 to 1,000 rpm. 3. Lubricate. Keep things cool and slick by using cutting fluid or a multi-purpose oil. When making a performance camshaft upgrade on a LS engine that was originally equipped with the active fuel management system (AFM or DOD) you should remove the AFM solenoid assembly from the engine and convert the engine to a non-AFM valve train. Here’s how to do it the right way. Inside the LS engine valley, there are eight oil holes that feed a solenoid assembly that is bolted to the bottom of the original AFM cover plate. If you were to simply remove the AFM solenoid assembly from the original plate and not plug the oil feed holes, the oil would continue to be pumped to where the AFM solenoids were located. This will cause a low oil pressure situation. This excess oil will also collect in the engine valley before eventually running off into the crankcase. If you replace the original AFM plate assembly with this new GM cover plate, it has eight small protrusions that seal off those eight oil feed holes. 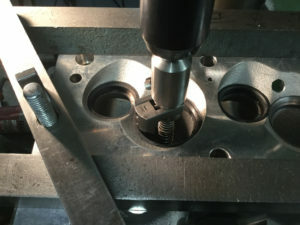 When cutting in valve seats with a single, multi-angle blade, especially new ones, try to do the least amount of work with the profile tool as possible. For instance, if the bottom angle is 75°, cut as much of theseat away as you can with that single blade and then come in with your seat profile blade and finish the remaining upper angles. It may take a few cuts back and forth to get the height established, but then zero your end stop for the rest of them. It goes real fast after the first one. An inexpensive digital read out (DRO) on my quill has really helped the accuracy and speed on multiple tool setups. You’ll find that you get much less run out and chatter. Also, you get longer tool life on the critical blade. I prefer to touch the seat angle with a stone to finish. 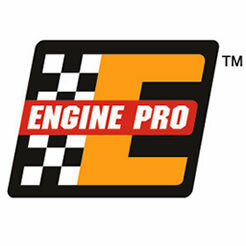 The EJ series 2.5L boxer engine has been powering many Subaru vehicles since 1996. With many different variations, they all share the potential for developing head gasket leaks. OEM gaskets were composite or early generation MLS designs, both of which can be prone to leaks. Early gaskets tended to leak combustion gases into the cooling system or coolant internally into the oil. With coolant loss you have overheating. Later gaskets tended to develop external coolant and oil leaks. Initially noticed by the smell of oil and coolant burning, leaks can also be seen at the head gasket joint. • Heat Cycles – Even though the motors are all aluminum blocks and heads and they expand at the same rate, these lightweight castings will flex. • Electrolysis – Can be a major cause of external coolant leaks. Corrosion at the battery cables and at the battery ground may be indicators of electrolysis in the cooling system, which is causing the coolant to become corrosive, eroding gaskets and castings. • The Subaru Boxer Design – Flat and horizontally opposed means that oil remains in contact with the head gaskets instead of draining back to the oil pan when the engine is shut off. Over time, this constant contact with oil can cause an inferior head gasket to deteriorate. • Abnormal Combustion – Detonation may cause head bolt stretch. Though detonation can occur in naturally aspirated engines, many owners of the turbocharged models will experience detonation and pre-ignition due to the increase cylinder pressures. This is often multiplied because the owners of the turbocharged Subaru mopdified the engines and increase boost to increase power. This creates even higher cylinder pressures and temperatures and increases the likelihood of abnormal combustion. And in extreme cases, the combination of increased temperature and pressure can cause OEM head bolts to stretch. The solution is to start by replacing inferior gaskets with proven MLS gasket designs using multiple layers of hardened stainless steel with embossed beads and special coatings. The ceiling beads act as springs to maintain sealing strength throughout heat cycles and extreme conditions. Coatings negate the possibility for excessive scrubbing as a casting expands and contracts. As with any engine that uses torque-to-yield head bolts, new head bolts are recommended, even though factory repair manuals do not call for new bolts. Always follow the correct and most up-to-date torquing sequence and specifications when installing head bolts. 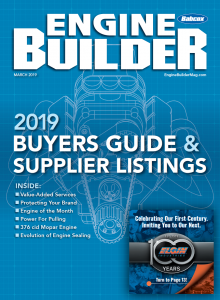 To submit a Shop Solution simply mail your entry to Engine Builder Magazine, Shop Solutions, 3550 Embassy Parkway, Akron, OH 44333; or email to [email protected]. Shop Solutions may also be emailed to [email protected].You must include your name, shop name, shop address and shop telephone number. Submitted Shop Solutions not published will be kept on file and reevaluated for publication with each month’s new entries. If you include your email address you will be emailed notification of publication if your Shop Solution is chosen.